Whatever You Call It - SVIWG DO IT! Use the link below to take a look at the brilliant short documentary film, developed by Sheffield Hallam University Students, featuring members of our walking group. Some of our walkers describe their experiences. THE SHEFFIELD VISUALLY IMPAIRED (VIPs) WALKING GROUP offers visually impaired people (VIPs) the opportunity to go walking regularly, assisted by trained volunteer guides. WALKS - We have an annual programme of walks in and around the Peak District and South Yorkshire. Walks vary in length and degree of difficulty to suit the varying capabilities of the VIPs. So - whether you want an easy 4 to 5 mile amble, a 6 to 7 mile ramble around the countryside or a bit more demanding hike into the hills we will have something to suit you. And bring your guide dog. He or she will enjoy the exercise as well. Are you sometimes lonely or and find yourself unable to go walking because no-one is available to help? We offer the opportunity for you to get out into the countryside - good exercise, fresh air and, most importantly, friendly company. 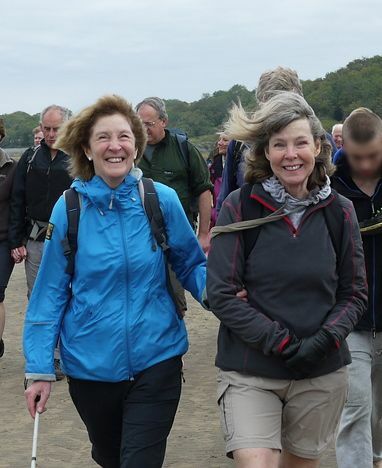 And walking in a group can often be stimulating and provide a sense of security, teamwork and achievement, which can lift your moral and boost your self-confidence. You will also learn new things! Our leaders are experienced, and will usually have lots of interesting things to tell you about the local area..
TRANSPORT- We travel to and from our walks mostly by public transport, although sometimes we need to use cars or a mini bus. Occasionally we use a coach for days out. WALKING HOLIDAYS- We organise a walking holiday each year. Recent destinations have included The Yorkshire Dales, Llandudno, Isle of Mann and Northumberland. 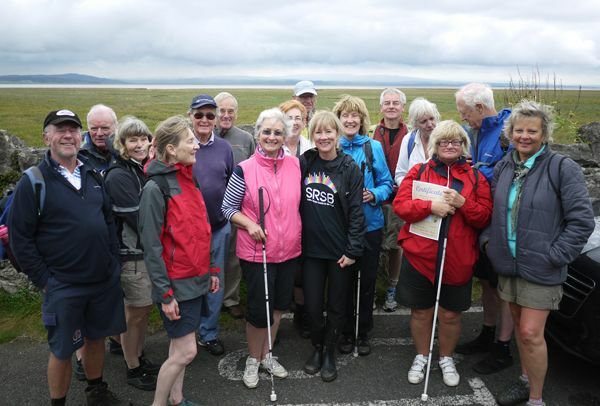 TOUGH CHALLENGES- In recent years small groups of VIPs and guides have raised money doing things like climbing Kinder Scout, Ben Nevis and Scafell Pike and walking across Morecambe Bay (see photograph below). We're always open to suggestions about new challenges to tackle! SHEFFIELD ROYAL SOCIETY FOR THE BLIND - Who provide us with facilities for meeting and sending out information to members. SHEFFIELD CITY COUNCIL- The Physical Disability and Sensory Impairment Service. Who organise training for our guides, and refer and provide information to registered VIPs. Members are kept informed by our website and a monthly newsletter: printed, emailed or in audio form. We rely on donations and funds that we raise ourselves through sponsorship, etc to meet our running cost.